Thanks for your kind words and help. Just a short note to let you know that the inspections at your facility went extremely well. Your people, especially Jose and Octavio were very helpful as well as skilled. Even Mr. Piper dropped by to see that all was going well. Thanks again for helping Tejas Quality Management and Samson get a job out under trying circumstances. I just wanted to send a note to show my appreciation for the great presentation that was put on for the University of Texas students last week. Jose and the guys did a very thorough job of demonstrating the CamVision equipment and answering some of the students questions. I was also real impressed with the work being done on that new gantry UT unit. From what Jose tells me it is going to be a real good tool for our inspection moving forward. "…We also appreciate very much the work and advancements that Technical Industries made now several years back to put these capabilities in place first when others were reluctant and/or slow to act. That type of leadership can be hard to find at times and it is clear that the actions that TI took put pressure on the entire community to keep moving the technology forward…"
We at North American Interpipe, Corp., wish to thank you and your group working at Technical Industries Inc. for the professional way you are handling our company's business. Our Quality Control Department is impressed with your latest inventory tracking program which allows us to track our ongoing work and stored inventory from anywhere in the world. Technical Industries. Inc. inspection technology including the Visonic(TM) 3D imaging and the VisonArray has proven to be reliable and the most advanced. Thank you for your services and cooperation. Technical Industries, Inc. (TI) and TH Hill Associates, Inc. (THHA) have had a working relationship for over 10 years. THHA has witnessed numerous Standard DS-1tm inspections preformed by TI. TI has shown the ability, capability, and knowledge to perform Standard DS-l tm inspections. TI is not a "Registered Vendor" as defined in Standard DS-I tm, Chapter 4, Third Edition, January 2004, but it is not required to be a "Registered Vendor" to perform DS1tm inspections. 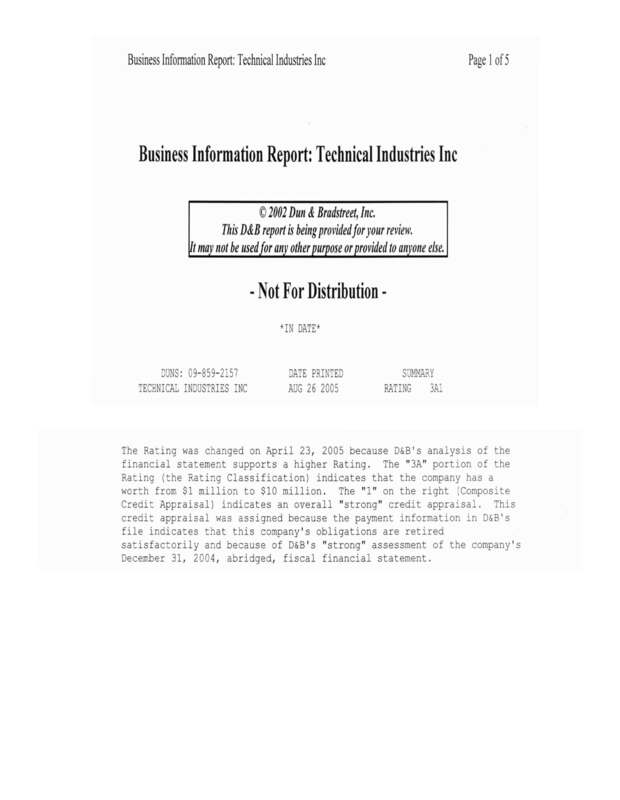 The Latest NDT Inspection Imaging Technology From Technical Industries, Inc.
Fox15 News April 27 2007 9 PM News Louisiana Steel, Inc.
03/27/2006 - LaPort Sehert Roming Hand Auditors Announcement Letter.